We know that all teachers want the best for their pupils and try to make learning as interactive and engaging as possible. Whilst chick hatching schemes are mentioned in the National Curriculum as a great way to gain first-hand observations and satisfy cross- curricular links, teachers may not realise the ethical implications or be aware where the chicks end up. The charity does not support the hatching of eggs in schools or other environments as it isn’t possible to control the number of cockerels which are hatched and these are almost always unwanted. We receive calls every day from people asking us to take in their unwanted cockerels, and we simply are not able to do so. Any educational benefits gained from hatching projects are increasingly outweighed by the growing number of unwanted males and the charity is addressing this issue by offering an education programme involving our own hens and the provision of an advertising service for unwanted cockerels. What’s the problem with chick hatching? Even the most attentive class teacher may struggle to give the eggs and chicks the full care they need. Fertilised eggs are turned by a mother hen around 30 times a day to ensure the chicks inside the egg don’t get stuck to the eggshell, which can result in injury or death. Eggs and chicks may also be left unattended over long periods such as evenings and weekends, meaning their needs may not be met during these times. Once a chick hatching scheme is completed, chicks will either be returned to the company where their fate is uncertain, or they may be re-homed by someone in school. Even for those chicks that find a home, the cockerels are usually unwanted. The British Hen Welfare Trust receives daily calls asking for help to re-home unwanted cockerels which have been hatched through such schemes, and the numbers are growing. The BHWT’s Education Programme has been created to offer alternatives to chick hatching in schools. Why not book a workshop for your school? Children can still learn about lifecycles and other scientific topics alongside Social and Emotional Aspects of Learning (SEAL) through the range of free, curriculum-linked, workshops on offer. 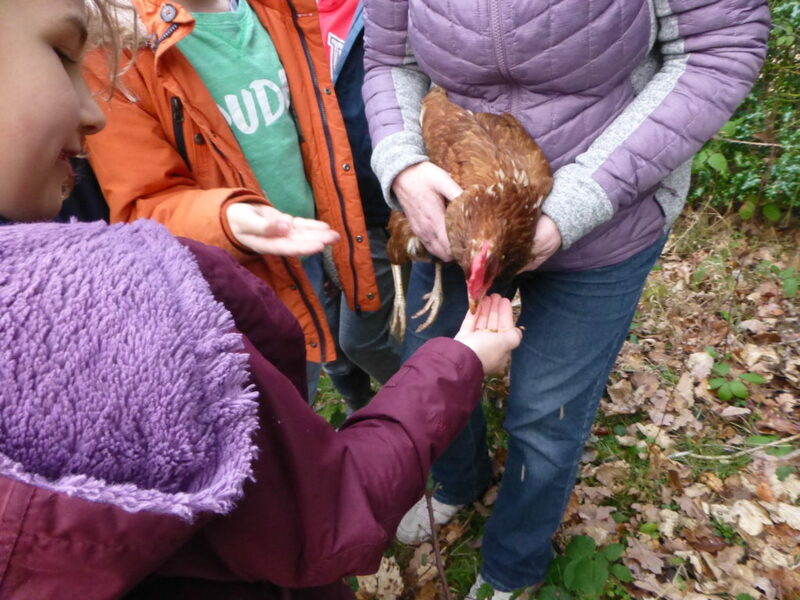 They also get the chance to meet and interact with a hen that has been happily re-homed having already spent some of her life on a commercial farm, instead of hatching new chicks, whose fates are uncertain and whose lives may be cut short. We also offer a range of free, downloadable curriculum-linked resource packs for use by teachers in schools. These are designed to support literacy, numeracy, science, SEAL and more! Each resource pack contains a number of lessons aimed at EYFS, KS1 and KS2. Finally, why not adopt your own feathery flock to live on-site at your school? Adopting a small flock of hens is a wonderful opportunity to develop team working, a sense of personal responsibility, financial literacy, a good awareness of hygiene and personal safety, and a huge range of curriculum-supporting skills. It can bring different age groups, staff, parents, and the local community together and enrich school life in positive and unexpected ways. To find out more, simply visit our Re-homing Hens in School page.